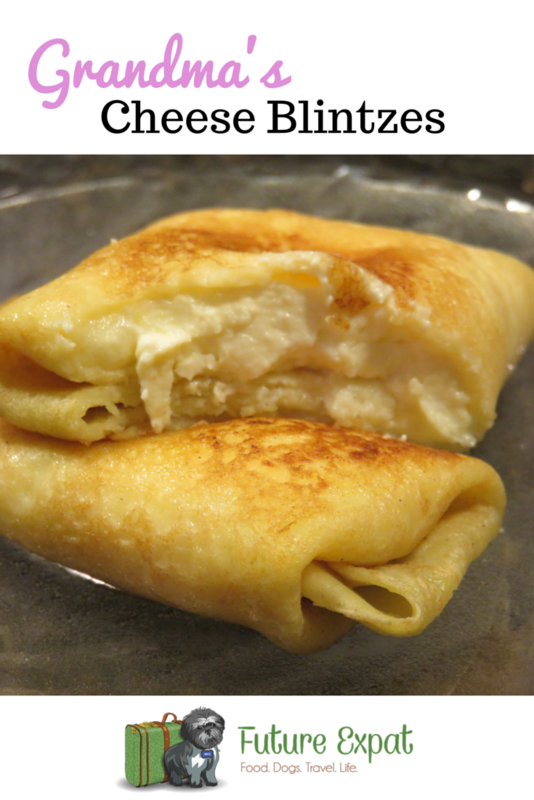 While I’ve ordered cheese blintzes over the years while dining out at a Jewish deli and even tried the frozen ones you can buy at the grocery store, nothing compares to the cheese blintzes of my childhood. My Grandma made them once or twice a year, and served them as a side dish at special dinners. I was an adult before I realized that everyone else eats them for breakfast or brunch. And even the restaurants didn’t made them as good as my Grandma. 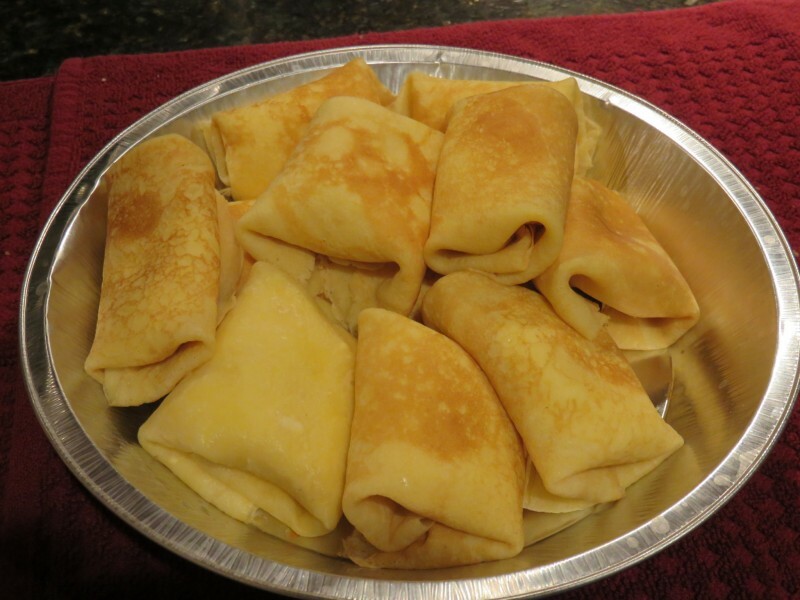 A couple of years before she died, I asked Grandma to teach me how to make her blintzes. She sat at the kitchen table and my mom and I followed her instructions, doing everything ourselves. I’m so glad I asked. This is one family recipe that deserves to live on. 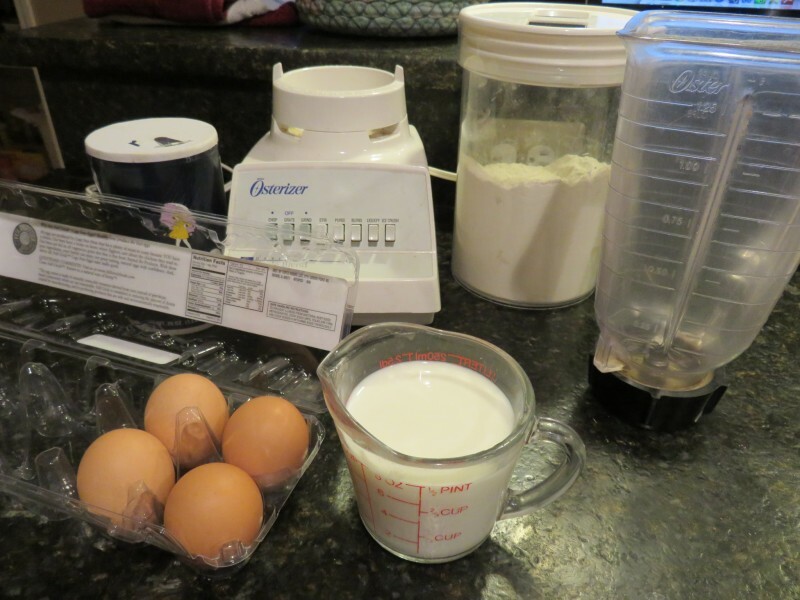 One thing to note…she insisted you MUST use the blender for the crepe batter. She was right…I tried doing it with just a spoon the last time I made them and I ended up with lumps. Her classic recipe uses dry cottage cheese, which I haven’t been able to find since the fish market she sent me to for the cheese closed down. I always make the recipe with her substitute, soft farmer’s cheese, which can also be hard to find. 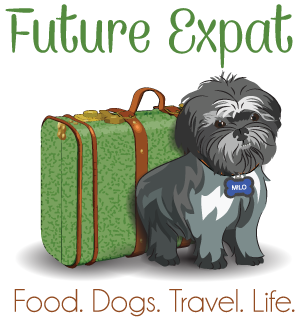 Try the kosher section or an international grocery store if you have access to one. Otherwise, go ahead and substitute ricotta cheese. It won’t taste exactly like the original, but it is pretty close. 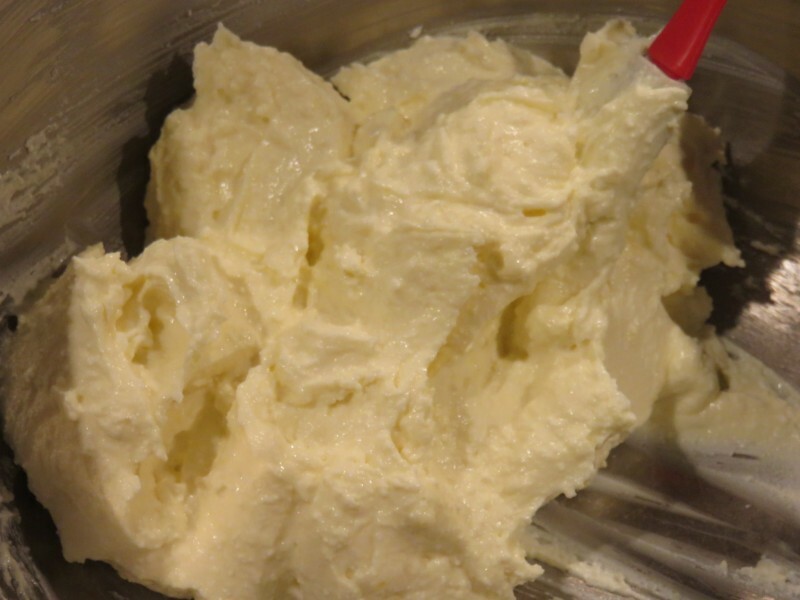 Prepare the cheese filling by mixing the cheese with a hand mixer until smooth. 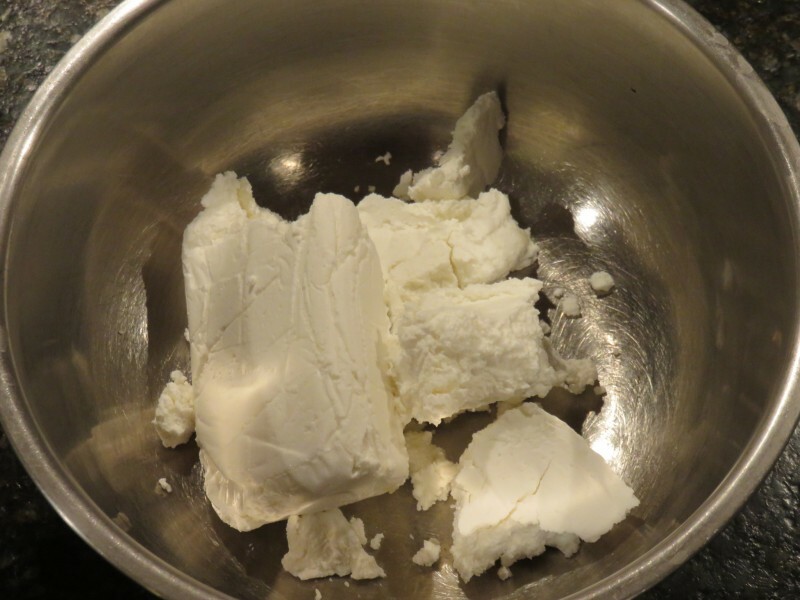 One at a time, add cream cheese, egg yolks, butter, sugar and salt. Beat well and set aside. 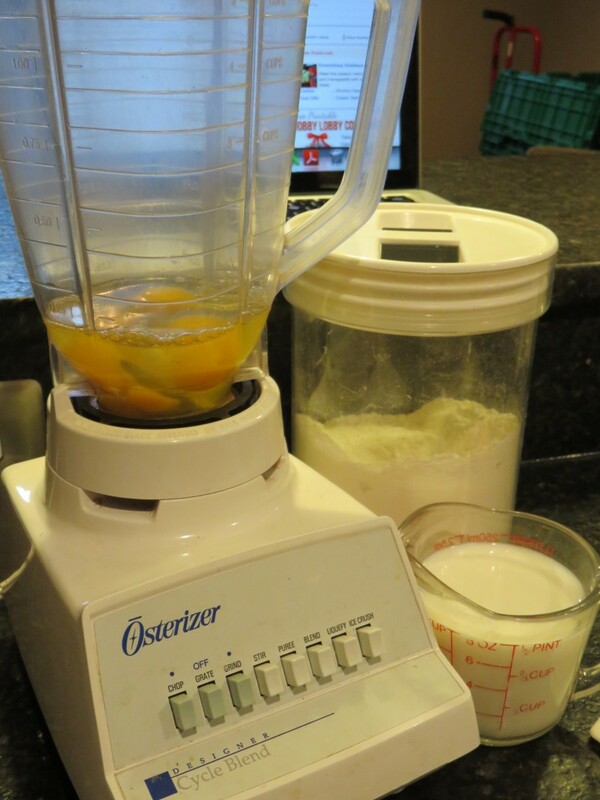 To make the batter, beat the eggs in a blender, then add milk and blend. Remove blender lid and stir in flour and salt slowly until batter is smooth, and then give it a quick whir with the blender to get rid of the lumps. Now you are ready to start making the crepes. Heat a 6 inch skillet on the stove. Once it is hot, lightly brush it with melted butter. 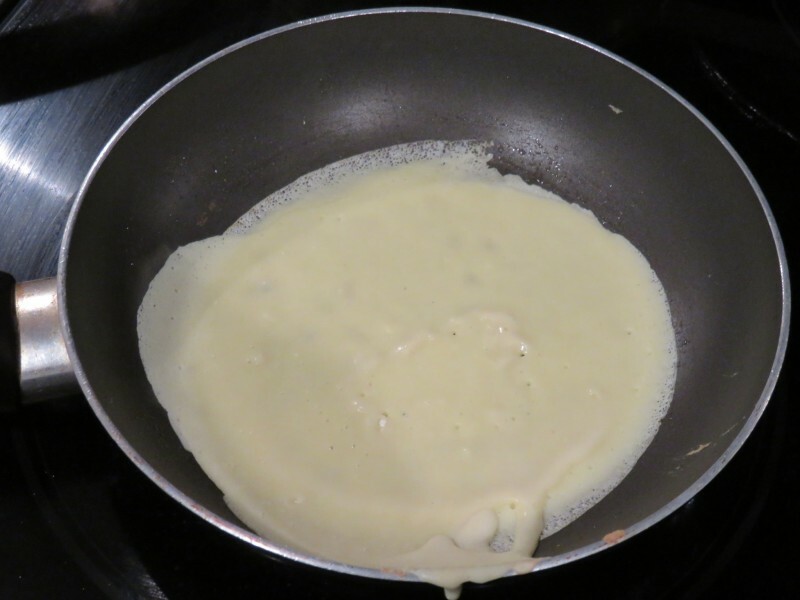 Pour only enough batter to make a very thin pancake into the frying pan, tipping it from side to side until the batter covers the bottom. Pour off excess batter back into blender as soon as the batter begins to set (the pancakes should be as thin as possible while still covering the bottom of the pan). 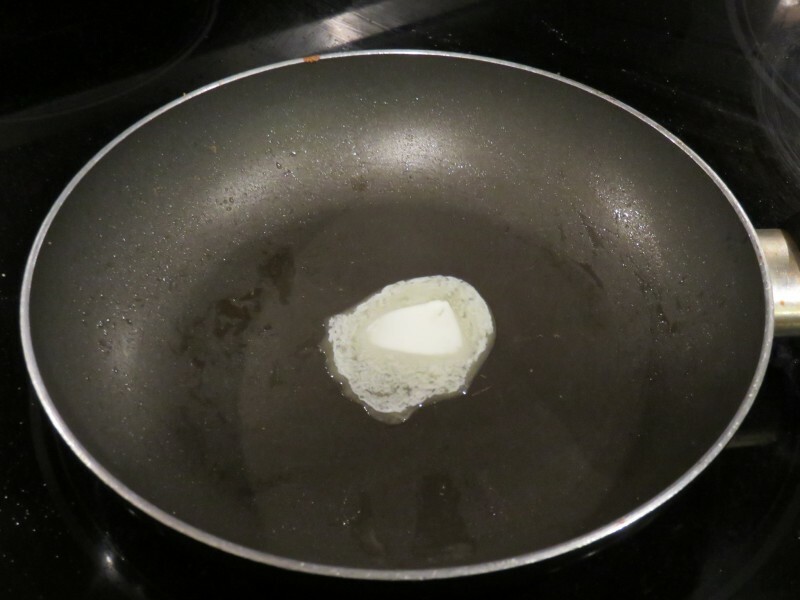 Cook until the edges begin to pull away from the pan and are slightly browned. 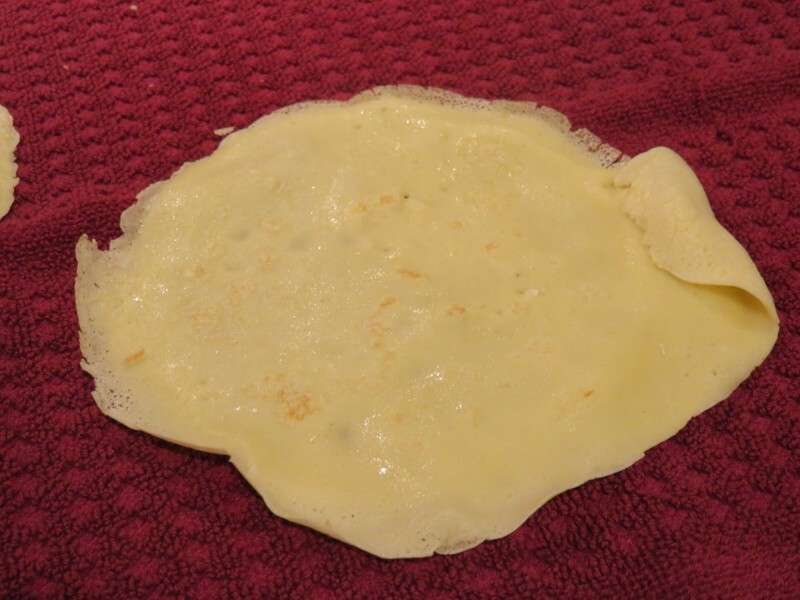 Turn pan over and drop crepe onto dishcloth. 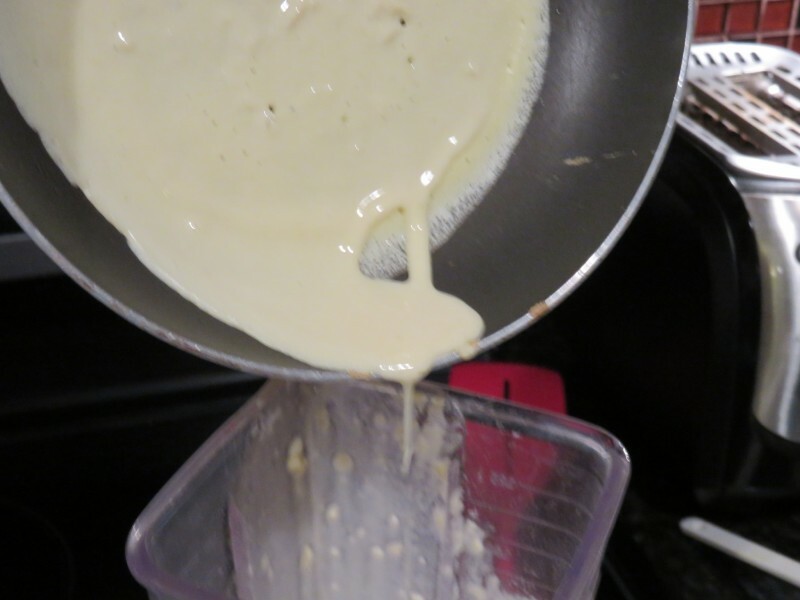 Do NOT flip the crepe and cook both sides in the frying pan…they will get too stiff! 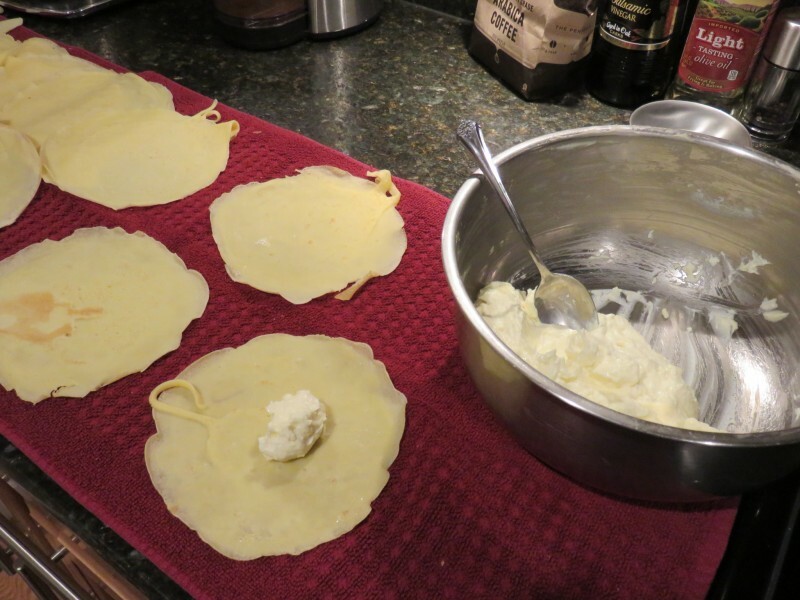 Brush pan with butter before each crepe and repeat until the crepe batter is gone. IMPORTANT! 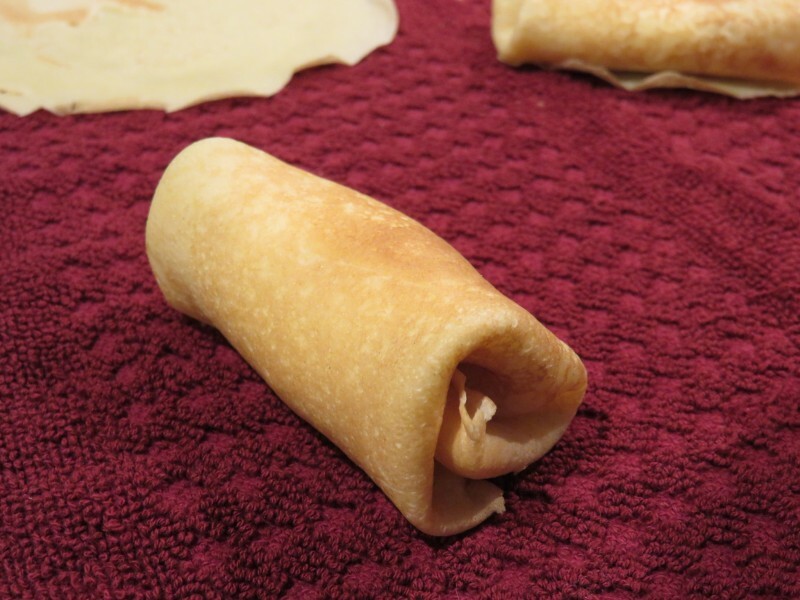 Do not place crepes on top of each other until they are completely cooled. You will want plenty of counter space to spread out the cooling crepes as you continue making additional crepes. It doesn’t take long for them to cool, so you can overlap them on top of each other by the time a few more crepes are finished. 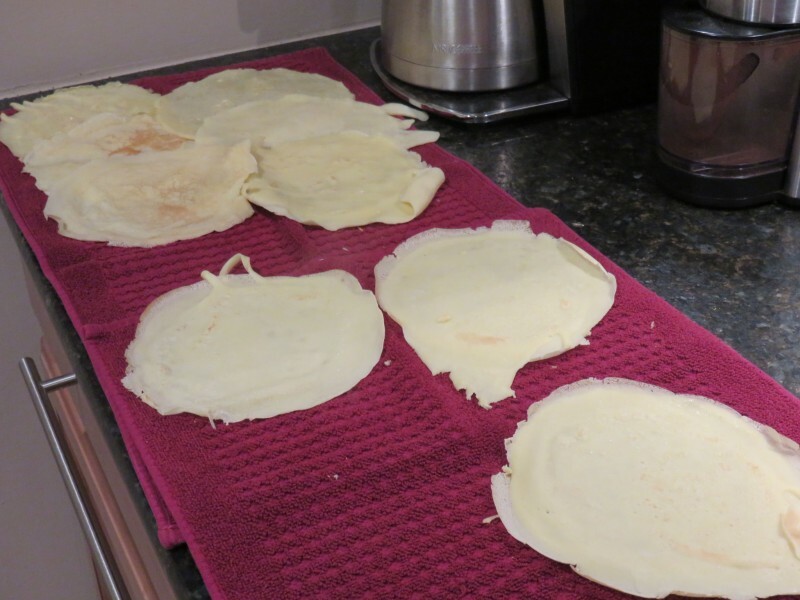 After the crepes are finished, spread them out with the unbrowned side up. 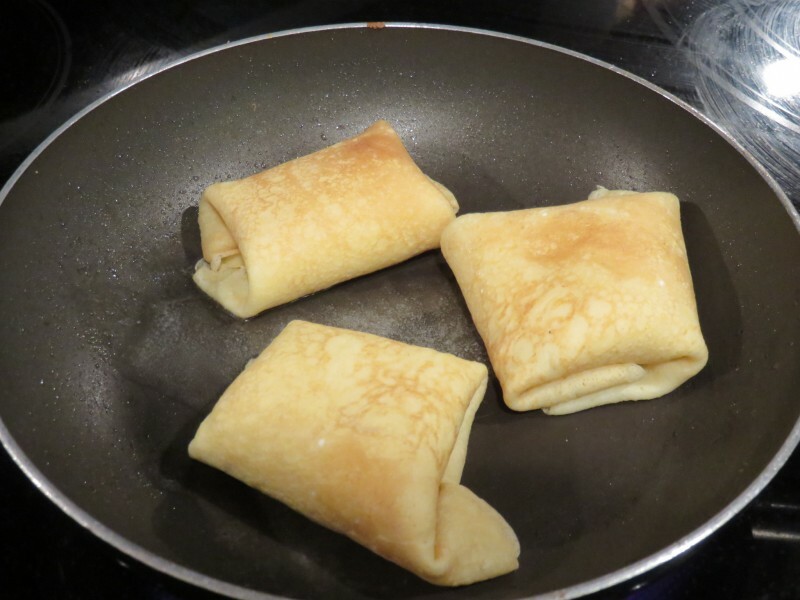 Place a rounded spoonful of filling in the center of each crepe. Fold both sides in and then fold up the bottom. 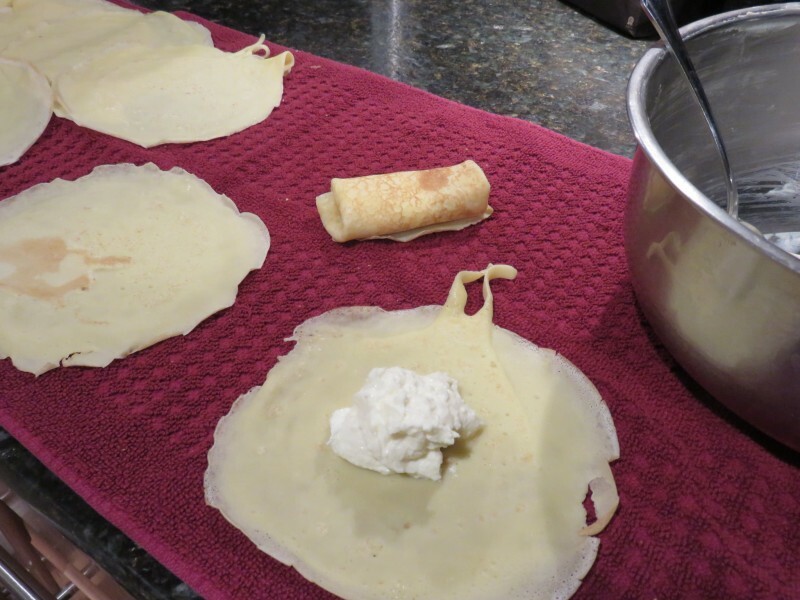 Then roll the blintz upward and lay it with the open flap on the underside. Don’t worry about the pieces that resulted for pouring the excess batter back in to the blender. 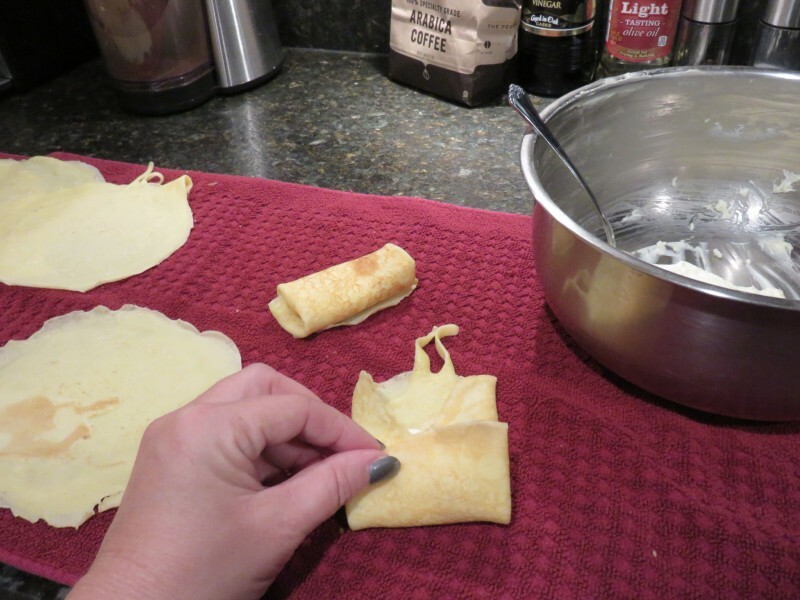 You can rip them off or place them on the sides where they will disappear into the inside of the crepe. 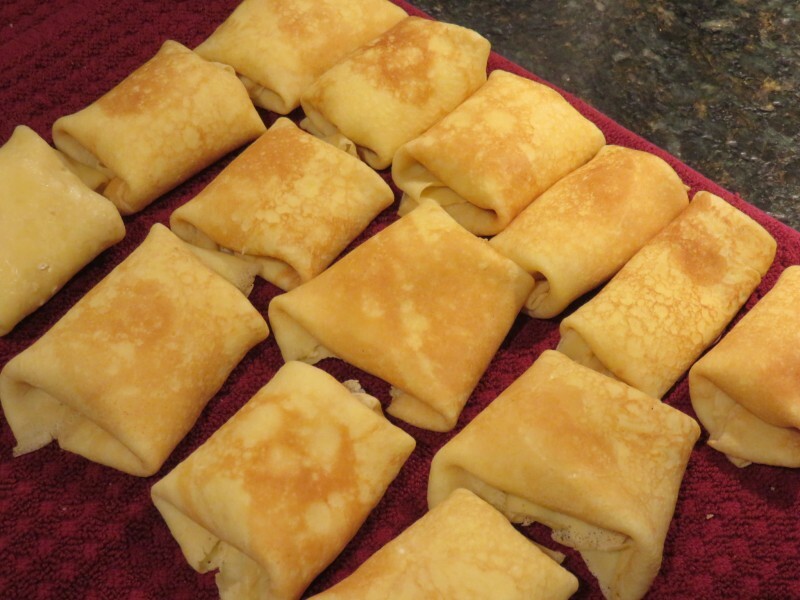 My Grandma’s blintzes were always slightly flattened, but mine ended up round or sometimes square. I’m not very good at the rolling part of this recipe. Crepes can be refrigerated or frozen at this point. While the recipe isn’t hard to make, it is involved enough that you’ll want to make extras for later. I encourage you to make a full recipe or cut it down only in half. You’ll be glad you did. 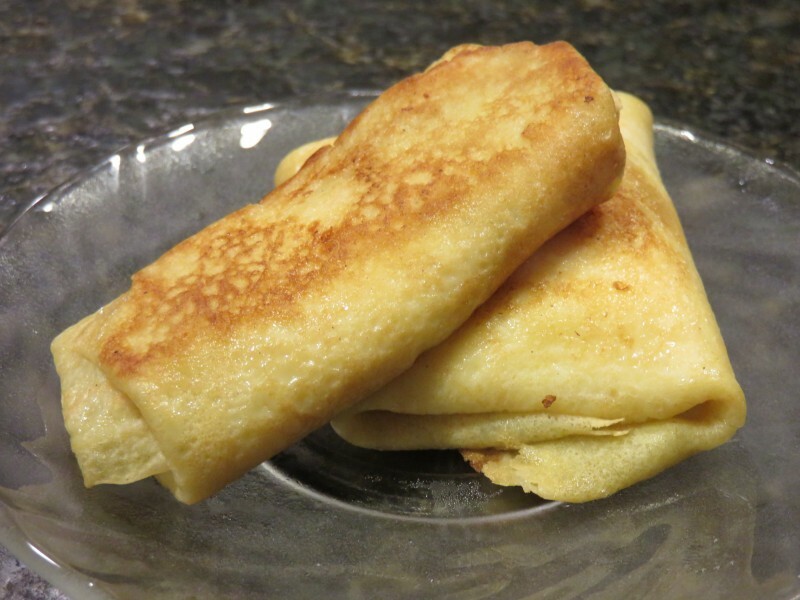 When you are ready to serve the blintzes, fry them in butter in a frying pan. 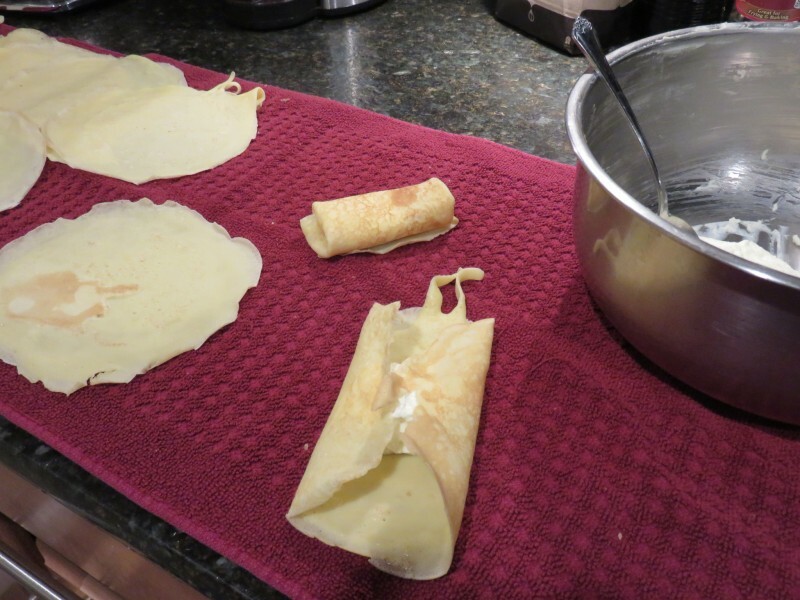 Flip them to lightly brown the blintzes on both sides. Be prepared to use a lot of butter in this step! The frying pan won’t get them heated all the way through, so you finish up in the oven. Place the fried blintzes in a single layer on a cookie sheet or jellyroll pan, and then heat them at 200 degrees for 15 minutes. Do not overheat or the cheese will get stringy. Serve with cinnamon sugar, sour cream or jelly. Or eat them plain…they are wonderful all by themselves.